Four Zippered Pockets: Two handwarmer pockets, one chest pocket and a large back pocket. Anatomically designed with a longer back and longer Sleeves. Three-layer, High performance materials with a fleece liner. The fabric blocks the wind completely and yet is breathable and thermal. The fleece liner captures and traps your heat in the cold weather. The fabric has a waterproof breathable membrane laminated in within the fabric to enable the release of perspiration water vapor for breathability. A 3-layer material is highly technical to create a breathable garment. The outside layer is a densely woven polyester that has a DWR (durable water repellent) finish. 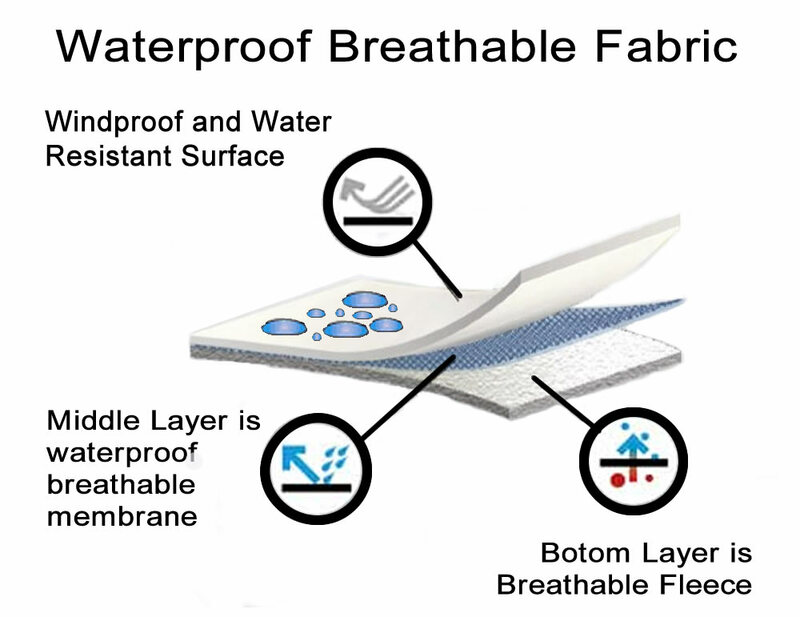 The middle layer is a waterproof breathable membrane that is sandwiched between a face fabric and inside fabric. Waterproof breathable laminates are very thin and fragile, so they work their magic when laminated to other substrates that enhance the performance of the materials. 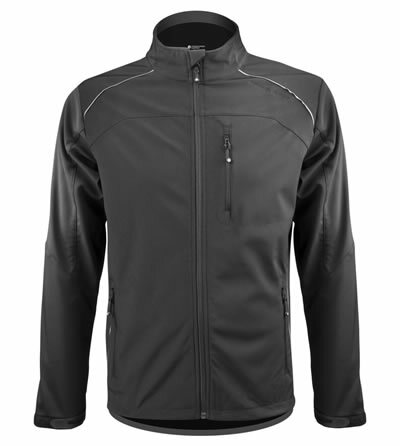 The bottom layer is a stretch polyester fleece that wicks moisture and perspiration away from the body. The material combination called micro-fluid technology, literally collects sweat through the side that comes in contact with the skin and transports it to the surface. The Three layer material is durable and highly functional during fitness activity. 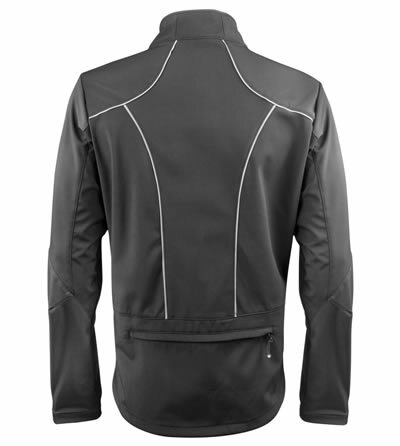 The technical windproof breathable fabric's design is ingenious. It is woven with hydrophobic (water wicking) yarns that collects water from sweat from the inside of the garment and pushes the moisture along the woven yarns and through the breathable membrane to the outside for evaporation. What's important to note is that the wicking process happens naturally due to the three layer fabric that is highly engineered for physical activity in the cold weather. It is easy to wear and feels fantastic. it is good for everyday warmth too! Needed jacket for winter riding in Illinois. Is sharp, fits as expected, and is VERY warm. The wind does not penetrate this jacket. Exceeds my expectations and at a terrific price. I am 6'2" 235 and bought a size XL. I have long arms and this fits them great. I have been using this for cross country skiing and love it. When it is cold i put my phone in the back pocket which is out of the wind and stays warmer. The material has enough stretch that you can get a full range of motion with out the need to oversize. today I biked to work at 36f and the jacket with a thin wool undershirt was too hot, but to my surprise the waterproofing performed and it did keep out the rain. It also kept in the sweat, but I expect that as I can sweat a lot when working hard. The only improvement it needs is a vent across the shoulders. I love this jacket. Add Aerotech's windproof pants, and even the coldest days can be for comfortable riding. Absolutely excellent. Excellent protective coverage for a decent price! Good fit and feel... will get a few years worth of cycling rides out of the jacket... and will put the jacket through several tests... thanks for the quality and getting it delivered so quickly! Very stylish, fits well, quality construction, functions as advertised. I bought this jacket online a couple of weeks ago and it arrived within days. I used it three times for cycling in 40ish degree F weather and in windy and damp conditions. I had to open the front zipper a bit to cool off. I did sweat but the jacket breaths well. I would expect that this jacket will be good for vigorous activities well into freezing temperatures. I have not tried it in natural rain but wore it in the shower for about 2-3 minutes to simulate a cold downpour. The water beaded off nicely and I stayed very comfortable. Workmanship materials and design are top level. Very pleased! Awesome jacket. Completely windproof as advertised, and warm for me down to 40 degrees with a thermal long sleeve underneath. Very stylish too. This has been my go to jacket for winter mountain biking this season. It fits well, it moves with me and it keeps me reasonably dry and warm. This jacket is similar to a technical piece I've had from another brand with some added features the other didn't include. For instance, the tail is longer keeping my rump drier and the cuff is larger allowing for more fit tuning around larger winter gloves. I'm also a fan of the reflective pipping though this is less an issue when riding offroad. It does come in handy when riding my fat bike around town as he snow falls. I use this as my outer layer mixing under layers for weather. The windproof and warm jacket allows me to make changes in other apparel and stay warm on rides that have ranged from around freezing to below zero. It's also a great piece for use as a non-cycling jacket. I wouldn't rely on it for warmth if I were out walking the dog in sub-zero temps. However, used as a jacket for quick trips in and out it works well. Also, imaging getting a flat tire on the road when it's snowing. The added tail works as crack protection when squatting or bent over on the side of the road. And this jacket cost less than that other brands jacket. Love it, wear it on and off the bike. Love the fit and keeps you nice and warm. Fits according to the sizing information provided.